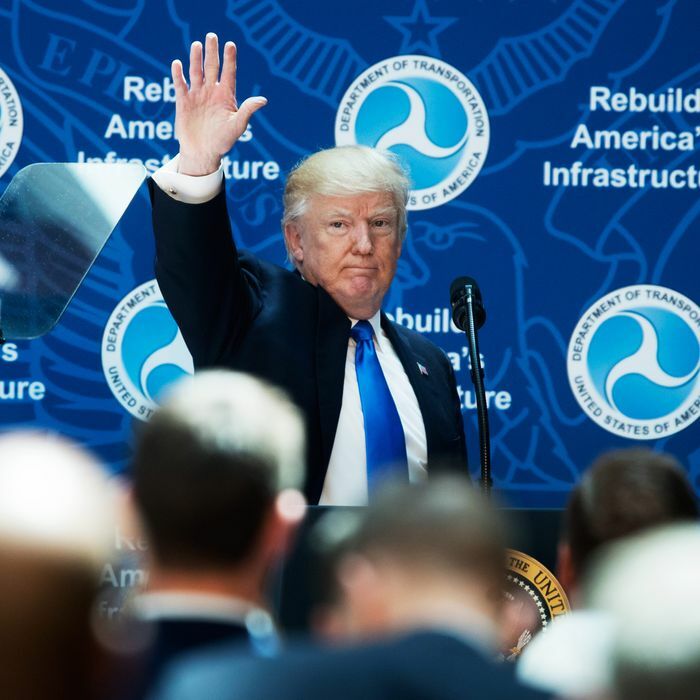 While nobody knew just what was going to happen in the immediate wake of Donald Trump’s election, one outcome that seemed foreseeable was the passage of a major infrastructure law. Democrats had long favored such a measure, and Republicans, who had blocked it largely to deny a victory to President Obama, no longer had any such incentive. The opposition was eager, or perhaps simply obligated by the pretense of bipartisanship, to cooperate. “As President-elect Trump indicated last night, investing in infrastructure is an important priority of his. We can work together to quickly pass a robust infrastructure jobs bill,” announced Nancy Pelosi. Trump’s building background made him not only eager to pass such a bill but — unlike almost every other policy question he faced — he actually possessed at least a modicum of understanding of the issue. I’m the guy pushing a trillion-dollar infrastructure plan. With negative interest rates throughout the world, it’s the greatest opportunity to rebuild everything. Shipyards, ironworks, get them all jacked up. We’re just going to throw it up against the wall and see if it sticks. It will be as exciting as the 1930s, greater than the Reagan revolution — conservatives, plus populists, in an economic nationalist movement. As it turned out, we have reprised much of the excitement of the 1930s — presidents demanding the imprisonment of journalists and members of the opposing party, Nazis holding torchlight parades — but no infrastructure bill has materialized. After months of inaction, White House press secretary Sarah Huckabee Sanders announced today, “I don’t know that there will be one by the end of the year.” And so the once-fabled infrastructure bill has died a quiet death. Why did Trump never bother to draw up an infrastructure bill? It turned out, “populists” and “economic nationalists” never had much pull in Trump’s White House. The policy jobs went to conventional Republican conservatives, who pursued conventional goals like cutting taxes for corporations and attempting to dismantle Obamacare. At several points, Trump said he would get to infrastructure later on, perhaps attaching it to some other measure because it was popular and he was confident it would pass. The tax cut probably dealt the fatal blow to infrastructure. Republican leaders convinced Trump that the tax cut would give them a popular accomplishment that they could tout in the midterm elections (it didn’t). And once the tax cut had passed, the deficit soared, and Republicans, following the familiar script, had to start complaining about excessive spending in order to deflect blame for the deficit from their beloved tax cut. Passing a trillion-dollar debt-financed infrastructure bill might have been easy a year or six months ago. At this point, it would be difficult. Note that Bannon cited “negative interest rates” as a reason it made sense to borrow money for infrastructure. The rising deficit has changed that calculation. And actually financing an infrastructure bill would be impossible, given the Republican Party’s theological opposition to increasing taxes ever, for any purpose. Trump’s promise to “build the next generation of roads, bridges, railways, tunnels, sea ports and airports that our country deserves” appears destined to go unmet. We will always be able to look back on Trump’s first term and remember the many, many Infrastructure Weeks, which brought Americans of all walks of life together to appreciate the importance of transportation development. The real Infrastructure Week was not in any bill, it was in our hearts all along.